The Ottawa Zinesters Read! event is coming up July 22 at Pressed, and I wanted to provide a little sample of my zine writing for those who haven’t picked up an issue of Nightshift (or Night Shift, I go back and forth on this). 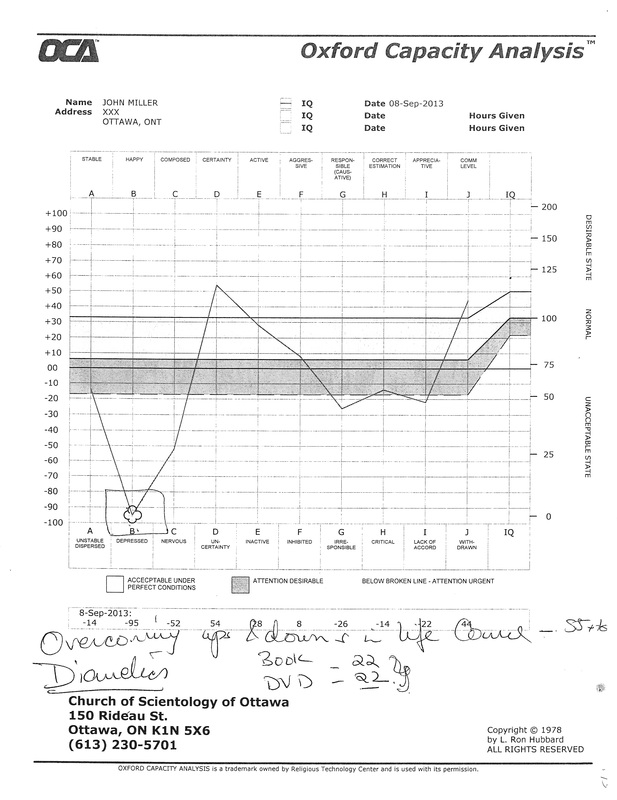 This is a short story about visiting the Ottawa Church of Scientology I put out last year. Rideau St., perhaps one block from the mall, an unassuming doorway with a sign offering a free personality test. The Church of Scientology, Ottawa branch. Having walked by it on my way literally-anyplace-but, I’d often been curious what lay inside. I imagined sinister machinery. Yuppies in sweatervests or corduroy, white certainly (although… Will Smith…), imports from California, perhaps, miens plaster and smiley as Travolta’s latest face. I’ve worked with Alberta Mormons before, a mostly insular group of beautiful, fair-skinned, oddly diminutive hotel keepers; maybe I just applied my one experience of cultishness to the general pop. Anyway, the other day I decided to go see Scientology for myself. I arrived dressed demurely so as not to cause alarum (i.e. no t’s with the word FUCKED written in caps, though my toenails did still have traces of red and purple polish). Two girls stood outside the door looking into the lobby at the posters inside; I ‘scused past them, feeling weird-as-all-get-out, and stood around a minute while they talked about what BS Scientology was and openly stared at me. In spite of myself, I flashed a sarcastic grin toward the propaganda, which I hoped would tell the stranger girls I wasn’t a cultist; then I remembered the point was to look like a potential cultist. Off to a good start. Beyond the lobby is a narrow stairwell with blandly painted walls. At each landing there are Scientology posterboards describing their study methodology, the electropsychometer (a machine which looks like a cross between a polygraph and a Geiger counter) and, most amusingly, a chart of the array of moods a person may experience, each illustrated with photos ranging from Hair Band Music Video Extra (bad) thru Glamour Shots Mama (great!). I made my way up slowly, hesitating at the door helpfully labelled “PULL.” Opposite this entrance is an unmarked door with dozens of envelopes wedged into the crack underneath. Not at all disconcerting. The Church’s main foyer is surprisingly cramped. Several stuffed bookshelves, each dedicated to one of Scientology founder L. Ron Hubbard’s many texts. Their cover designs look like what would’ve happened if Ayn Rand wrote airport novels. Hubbard’s doughy visage is literally everywhere; on the covers of a display of RON magazines for which he is Ms. January thru December; in serene, framed photographs on the walls; even in a large bust of the great man’s head and shoulders around the corner in the study area. Next to the bookshelves is a very comfortable leather couch and in front of it, a large, if slightly old flatscreen television glowing with the toasty, inviting flames of an Intro to Scientology DVD menu. Underneath, a small collection of DVDs with titles like The Golden Age of Knowledge for Eternity and Orientation. Also Bring it On, the Kirsten Dunst cheerleading movie (???). Behind the TV is a massive display unit holding hundreds of colorful pamphlets; it has a kind of ‘70s futuristic-Greek column-look typical of the Scientology aesthetic, and is clearly designed for a much larger space. In its cramped corner of the room, it appears comically oversized. There was a young-ish (by which I mean, slightly older than me) black girl with earbuds in putting books away. She greeted me with a hesitant but genuine smile. I told her I had often been curious about the Church and decided to have a look around inside. While I thumbed through the telephone-bookish Dianetics we struck up a conversation. She had been a Scientologist for less than a year, and had like me come in as a curious walk-in. She had not before been religious, though her parents had a religion she chose not to follow. I gently steered the conversation toward the advertised personality test and before long I was sitting at a desk near the entrance with a list of 200 questions and a Scantron sheet. Each question could be answered as +/M(aybe)/–. Are you a slow eater? Are you aware of any habitual physical mannerisms such as pulling your hair, nose, ears, or such like? If we were invading another country, would you feel sympathetic towards conscientious objectors in this country? Do you consider the modern “prisons without bars” system doomed to failure? Are you in favor of color bar and class distinction? In general, the questions varied from general personality test-type questions we’ve all taken in fits of boredom online to the outright what-the-fuckery excerpted above. (You can take the test online, BTW, but you have to come in to the local Church to get assessed, natch.) When I finished, another lady came in and introduced herself; she put on a ten minute film about The Life of Lafayette Ronald Hubbard for me to watch while she helped the other girl enter my results into the computer. I was oddly stunned that they had to do this manually, as I’m guessing even the Raeliens at least have a Scantron machine. When it was done, she took me into her office, a repurposed broom closet taken up almost entirely by a desk and a shelf of Hubbard texts. A tiny framed picture of the Great Man gazed at me placidly. She told me that whatever the results indicated, they were what I was telling her through my test answers, not her opinion. Apparently what I told her is that I am severely depressed, that I do not apply myself enough and that I am unable to relate to others. Even the aspects where I tested positively, such as my sense of certainty about myself, were spun to mean that I become angry when my conclusions are challenged (#@$%!). She was not unkind in handing out this damning analysis; when asked I told her where I thought the reading was right and where it felt off. I spoke honestly of my tendency to ruminate on past failures, my difficulty finding satisfaction with life, my fears. What I needed, she announced with a smile, was to take the “Overcoming Ups & Downs in Life” course at a cool $55 + tax and, most importantly, to purchase Dianetics in print and on DVD for a mere $22 each. Scientology could fix it all. I once washed out of an aggressively mediocre sales job hawking high-priced cookware in a matter of days, but I was there long enough to know a close when I see one. Instead, I asked her some questions about her own experiences with the Church, how it had affected her personal life (tough at first, but now they respect and appreciate it), how it fit with her prior beliefs (she remains a Buddhist). Finally, I asked whether she believed that Scientology has a supernatural aspect. After some dancing around, she admitted her ability to project her consciousness out of her body, to leave her tiny office to roam around the building as a spirit. It did not matter to her that she could not prove this to me, she said, only that she knew that she had done it many times. After a few more questions, I politely excused myself. She made no effort to hinder this, asking only what I thought and offering to screen Dianetics for me if ever I wished to return. On my way out, I saw five or six happy people perched all over the couch watching the television. I stepped out of the office, and looked at the dead letters bulging out of that opposing door for a moment. Then I went home, taking a pamphlet and a copy of my assessment home. My experience of the Ottawa Church of Scientology was that, like most fringey groups of churchy people I’ve met, it tends to appeal to the disenfranchised, those seeking community and meaning. It reduces life to a series of tests which can be mastered; if life is contained in those tests they have mastery over it as well. If believing that allows them to be fitter happier, so be it. Only do try not to look too closely at all those $22s and $55s flowing up the proboscises of the parasites squatting over it all, the squalid ugly enterprise which has survived even the deaths of L. Ron and his weird gods. This piece originally appeared in Nightshift #2, a zine I made with Abby Kashul. This entry was posted in Ottawa, zines and tagged church of scientology, journalism, l rob hubbard, nightshift, nonfiction, Ottawa, oxford capacity analysis, scientology, zines. Bookmark the permalink. ROFL! Like High School kids spending the night in a haunted house on a dare the night of graduation. You *know* the token black guy dies first and all the entitled white kids but one is going to get decapitated some how, only the *method* of their demise is in question. And all so that the few remaining dimwitted customers can play pretend. It’s not intended to be believed by actual people walking in off the streets, it’s all to try to wrest more money out of the rubes, marks, and suckers who are already hanging from the hook. These insane criminals have at most some 15,000 remaining customers world wide thanks to the advent of the Internet. These days everything but those in third world countries with no Internet knows what Scientology is and what they do. You walked in to a business office that will soon close. # 1 – You’re dishonest from the beginning; not providing your real name. # 2 – You never gave it a honest and fair chance. # 3 – The courses I took were amazing , the staff was amazing and trying their best to help and guide people WHO ARE WILLING TO LEARN, NOT SOMEONE WITH A BIAS, PREJUDICIAL MENTAL BLOCK. # 4 – You never met such a honorable man like Mr. L. Ron Hubbard, who sacrificed his whole life for the survival and happiness of humanity. # 5 – Just to let you know, I felt honored to be able to stand beside the Bust of Mr. L. Ron Hubbard, what to say if I met him? Kindly, Think Again! We are all human, we all make mistakes!